Nowadays, pregnant women are bombarded with a million different safety warnings. Safety warnings that tell them they should avoid exposure to pesticides, unpasteurized milk, aspirin, paint and even cat litter boxes. Warnings that are designed to keep a woman, and her fetus, safe and healthy. One warning, however, that seems to have been lost in the shuffle is the danger of driving for pregnant women. Car crashes are the single largest cause of death for pregnant women. Couple this with the fact that unborn children have a four times greater risk of death from a car accident than an infant, and it makes you wonder why this warning isn’t being shouted from the rooftops. In fact, many pregnant women aren’t even aware that driving may present a special risk to them and their fetus. If more women were made aware of this fact, then they could take the precautions necessary to protect themselves and their fetus. This leads many people to ask, is it safe for a pregnant woman to drive? The answer to that question is quite simple. Pregnant women can safely drive an automobile. While driving does present a serious health risk for a pregnant woman, it doesn’t mean that she should never get behind the wheel of an automobile. Below are some safety precautions that every pregnant woman should keep in mind before driving. 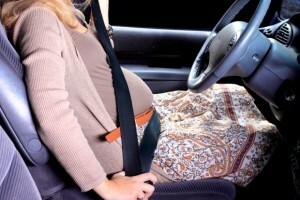 Pregnant women should wear seat belts, but they need to be used correctly. Seat belts should be placed under a pregnant woman’s belly and not over it. Placing the seat belt over the belly increases the risk of placental displacement, a condition that is potentially fatal to the unborn child. Women should also make sure that the seat belt is properly positioned across the chest. In no circumstances should the seat belt ever be tucked underneath the arm. Sitting too close to the steering wheel increases a pregnant woman’s chance of being injured by the airbag. It also increases the airbag injury risk to the unborn child. The front seat should be put as far back as possible. Low blood sugar can result in a loss of concentration that may result in an automobile accident. Pregnant women are especially prone to low blood sugar, so it is important they they eat before they hit the open road. On long drives, pregnant women should be as rested as they possibly can be and should take frequent breaks. As a general rule, a break should be taken after every 30-45 minutes of driving. These breaks don’t have to be long. Even a couple of minutes of rest and fresh air can increase concentration. Studies suggests that night driving triple the risk of an accident, so pregnant should try to drive as much as possible during daylight hours. They should also avoid driving in the rain because this can double the risk of having an accident. No one should try to multitask behind the wheel. This includes checking the vanity mirror, text messaging or making a phone call. Trying to multitask behind the wheel can have devastating consequences. If a pregnant woman is aware of the risks and takes a few simple precautions, then there is no reason why she can’t drive safely. When not selling cars, Andrew writes articles concering driving safety and how it might affect your health.